Banff and Buchan MSP Stewart Stevenson highlights the importance of Deafblind Awareness Week (DAW), which starts today and runs to 3rd July. “DAW is a health and social campaign that aims to highlight and raise the awareness of this little-known disability. There are approximately 23,000 people living with deafblindness in the UK, many of these have some residual hearing or sight. This campaign aims to educate the general public and medical profession. “Deafblindness has been described as one of the loneliest conditions in the world. Understanding your surroundings without sight or hearing is beyond comprehension as well as the lack of understanding of the disability can lead to feelings of isolation and helplessness. “This awareness week is a great opportunity to raise public awareness about issues facing people who live with deafblindness, therefore the celebration of Deafblind Awareness Week is vital for a number of reasons. It provides many great opportunities, including: to bring together old friends and make new ones while having fun, to celebrate the achievements of people within the deafblind community to introduce the general public, community groups and corporate bodies to issues facing people living with deafblindness to raise the public profile of deafblindness, which will in the long term assist with issues of resourcing and securing funds for services to promote the range of services available to educate the general community about deafblindness. Banff and Buchan MSP Stewart Stevenson has welcomed the news a substantial sum of new lottery cash will be heading its way north announced by Awards For All. “My congratulations go to the four successful organisations which have been awarded lottery cash. I am certain that the organisations will put this funding to good use and I am delighted to learn that this funding will ensure the continued service of these organisations. “It is well known that on previous occasions my constituency has found itself far from the top of the lottery funding league table. However, I continue, along with my colleague Alex Salmond MP, to ensure that we move up the table and get our fair share of the funding pie. One such way that we have achieved this was the creation of lottery surgeries which we held bringing together the main lottery bodies and made our case to secure a larger share of lottery funding for the North-east. Banff and Buchan MSP Stewart Stevenson highlights the importance of Huntington’s Awareness Week which runs from 20th - 27th June. “Every year, the Huntingdon's Disease Association organises a week of 'grand calorie events' up and down the country to raise awareness of Huntingon's disease (HD) and to help people put on a few pounds. The idea is to teach people that those with HD need extra calories. “Huntington's disease is an inherited, progressive neuro-psychiatric disorder and every child born to a parent who has Huntington's disease has a 50 per cent risk of inheriting the Huntington's gene. The disease affects males and females equally and currently there are between 6,000 and 10,000 sufferers in the UK. “Although, at present, there is no cure, the Huntington's Disease Association offers regional care advisers who can provide help and support. It 's important to remember that the condition affects different people in different ways such as people with a progressive form of the disease may experience many different symptoms, such as involuntary movements, difficulty with swallowing and speech, weight loss, emotional changes and depression. Around-the-clock nursing care is needed in the later stages of the disease and secondary illnesses, such as pneumonia, are often the actual cause of death. Banff & Buchan SNP MSP Stewart Stevenson is reiterating calls for the London Government to adopt the SNP’s fuel duty regulator plan immediately to help Scotland’s haulage industry. Mr Stevenson made the comments after Transport Minister Alistair Darling announced plans for a road charging policy which would charge drivers between 2p and £1.30 a mile. The scheme would take about 10 to 15 years’ to come to fruition by which time many Scottish hauliers would have gone to the wall. “The Government has produced a vague notion as a possible solution at a time when local hauliers are facing incredible pressures. “Why is Alistair Darling spending so much time talking about transport policy for 10 to 15 years’ time when Scottish business - especially the haulage sector - faces serious threats now? “The haulage industry is facing a bleak financial future. It is being subjected to the highest fuel tax burden in the EU and the working time directive will be the final nail in the coffin for many. “Instead of protecting Scottish industry, Gordon Brown is inflicting huge damage on the Scottish economy and the freight industry in particular. 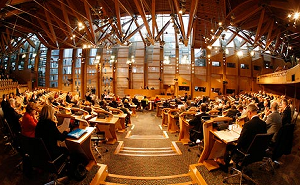 Banff & Buchan MSP Stewart Stevenson questioned Minister for Health Andy Kerr on NHS 24 service delivery at the Scottish Parliament’s Question Time. Mr Stevenson asked the Minister whether he had any plans to create local call centres for NHS 24. The move follows criticism in the media of standards of service delivered by NHS 24. “Local delivery of health services will always be better than remote delivery because local delivery draws on local knowledge. “NHS 24 is a useful resource for people but should not be viewed as a replacement for dialling 999 in cases of emergency. “Plans are underway in the NHS in England and Wales to computerise health records which will mean that healthcare professionals faced with a patient or casualty who is not known to them can access their medical history in making their assessment of what treatment is required. Shadow Deputy Justice Minister Stewart Stevenson MSP today demanded that Scottish Executive Ministers account for their contract with Reliance Custodial Services following reports that the deal struck with the private company may end up costing more than the previous publicly run service. sector, payments to them will also rise to the point where the cost exceeds the previous public sector cost. "We knew from the start that the Reliance contract was bungled. Now Professor Bird has calculated that after a run of escapes and unauthorised releases this arrangement may now cost the public purse even more than the previous arrangements. "In addition to this news, there is further evidence of trouble in the management of Reliance. “Companies House records reveal six resignations from the board of Reliance Secure Task Management Ltd since they were awarded the contract from the Scottish Prison Service. Three of these were as recently as 18th May. With a board of only seven, this suggests a company in crisis. "Ministers must now account for this financial and organisational chaos to Parliament." Banff and Buchan MSP Stewart Stevenson has lent his support to Diabetes Week. “Diabetes Week is the annual campaign by Diabetes UK to increase the public's knowledge of diabetes, its symptoms and effects, and to raise funds for research into a cure and I am certain that it shall prove to be very successful indeed. “With numerous fundraising events happening across that UK, there are many ways to get involved and help make this year the best ever. People are free to organise their own event or simply participate in an already organised event to ensure that the issue of diabetes is raised. “Diabetes mellitus is a condition in which there's an excessive amount of glucose (sugar) in the blood to which there are currently around 1.4 million people in the UK diagnosed with the condition. However, it is worrying to learn that it's estimated that a further 1 million have the diabetes without knowing it. “Treatment for the disease can prove to be very successful and Diabetes can be managed by a combination of healthy diet, regular physical activity and sometimes tablets and insulin injections. Banff & Buchan MSP Stewart Stevenson has questioned Scotland’s farms Minister Ross Finnie on the lack of a new entrants scheme to help Scottish young farmers. Mr Stevenson was speaking after it emerged that the Department for Agriculture and Rural Development in Northern Ireland had launched such a scheme last week. The Northern Irish scheme supports the establishment of young farmers under 40 years of age by providing an interest subsidy on loans. “This scheme must be very welcome indeed for the Northern Ireland agriculture industry and I am sure that it will be beneficial to farmers in Ulster. “However, our own Scottish Executive Environment & Rural Affairs Department (SEERAD) advise that they have no such equivalent scheme here which would undoubtedly assist young farmers in Banff & Buchan who want to enter the industry. “I know that there is support for such a scheme as it is a subject which is raised with me at the regular meetings I have with farmers and interest groups. SNP Stewart Stevenson MSP for Banff and Buchan today (Thursday) commenting of reports that that a new prison could be built in the North East. “When Justice Minister Cathy Jamieson visited Peterhead Prison at my invitation last August, I proposed a new prison at Peterhead to solve problems at both Craiginches and Peterhead. “It has been clear for some time the conditions at Peterhead need improved urgently. The best solution is a new prison to replace Peterhead, which is incapable of being brought up to modern standards. “It has been clear that Craiginches has been under pressure and that redevelopment on the existing site was simply not possible. “Consolidating two prisons into one based at Peterhead will create the opportunity for a modern efficient unit with a long term future. Banff & Buchan MSP Stewart Stevenson will be lending his support to Volunteers’ Week at an event in Fraserburgh tomorrow (Tuesday). Volunteers’ Week is a chance to celebrate the contribution made by the 22 million volunteers who give up their time to help organisations and communities across the UK. North Aberdeenshire Volunteer Network plans to mark Volunteers’ Week with a ‘Thank You’ event for volunteers to be held at Aden Country Park. They will also be taking part in the launch of the gardening project at Dover Lodge, 117 Charlotte Street, Fraserburgh at 3.10pm on 7 June. This event marks the start of the environmental phase of the Fraserburgh Practical Health Project and involves a group of pupils from Lochpots School. MSP Stewart Stevenson will be there to offer support and encouragement as well as demonstrating his gardening skills. “Anything I can do to raise the profile of volunteering and encourage young people to become involved is positively worthwhile. “I have been involved in helping to highlight Volunteers’ Week for several years now, ranging from simply being a driver for the Carers’ Support Project to this year assisting the pupils of Lochpots School with their project. To find out more about volunteering opportunities in your area contact Mary on 01771 622111. Banff & Buchan MSP Stewart Stevenson will perform the official opening of Cornhill Highland Games at the The Playing Field, Cornhill on Saturday 4 June (tomorrow). Cornhill resident Mr Stevenson will open the eighth games at 1.00pm. Events start at 11.00am and the Compere for the day is Robbie Shepherd.and there is a full programme of events including track and field, Tug O’War, heavyweight championships and Highland dancing culminating in the evening with the gruelling 8½ mile Knock Hill race.